Pre-heat oven to 200c fan-forced (220c non-fan) and line a baking tray with baking paper. Unroll pastry and lightly dust with flour, remove from plastic sheet, flip over and dust the underside with flour. Use an 8cm round cutter to cut 12 circles, the trim can be re-rolled to get another 4 circles. Place on the baking tray and place another sheet of baking paper on top of the pastry followed by another baking tray. Pop in the oven for 15 minutes, then remove top tray and continue to bake for a further 5 minutes until pastry is golden brown. Set aside to cool. Combine the water and caster sugar in a saucepan, bring to the boil, add chocolate and stir until melted then whisk in the butter, remove from heat. The sauce will keep for 3 days in the fridge. 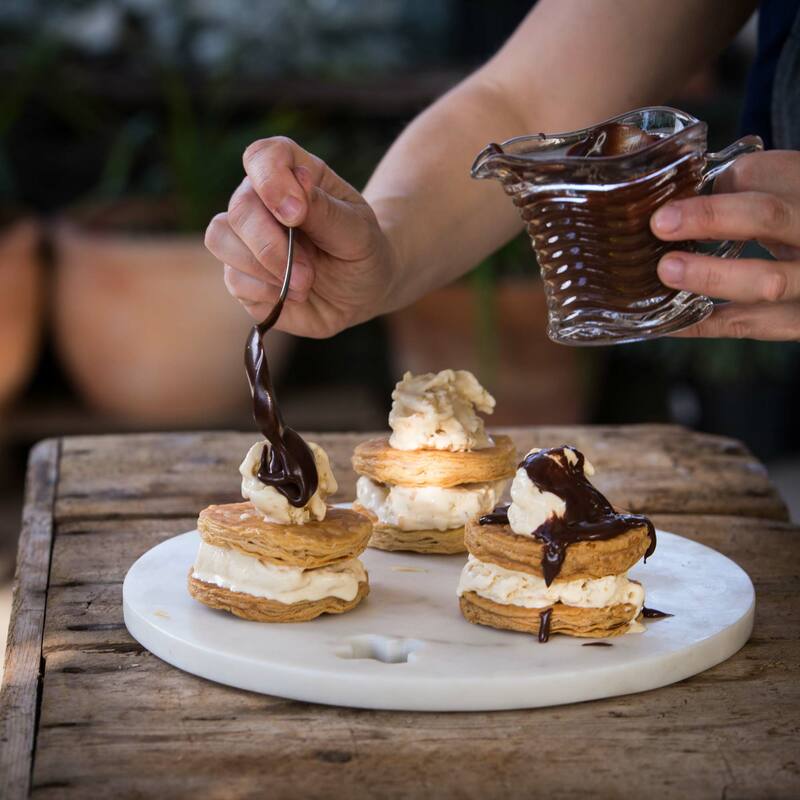 To assemble the sandwiches, place a disk of pastry on a plate top with ice cream, followed by another disk of pastry, followed by more ice cream, pour over the chocolate sauce and eat straight away! !